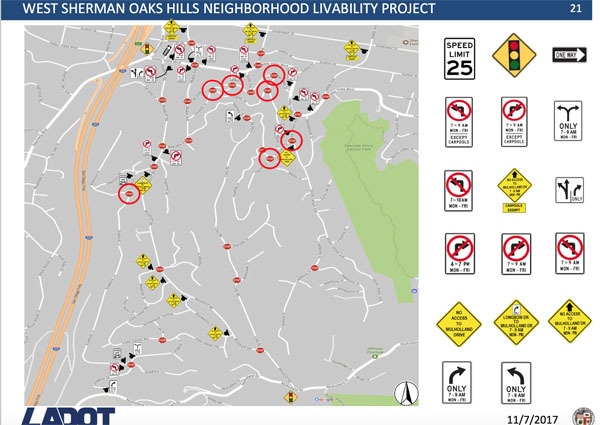 Recently, traffic studies have been conducted by LADOT to understand the current traffic congestion caused by commuters from the Valley who, instead of using the 405 or Sepulveda Boulevard, travel the residential streets in the Sherman Oaks Hills area. The proposed plans raises concern of an increase of traffic through Bel-Air’s residential roads. The Bel-Air/Beverly Crest Neighborhood Council (BABCNC) will hear public comment at their next Board meeting on Wednesday, November 15, 2017, 7:00 pm – 9:00 pm, at the American Jewish University, 15600 Mulholland Drive, Room 223, Main Campus, 2nd Floor, Bel Air, CA 90077. The Bel-Air Association encourages residents to review the plans and to submit their comments. Click here to link to the Preliminary NTM plan analysis and options. Can’t make it to the BABCNC meeting? Click here to link to submit individual public comment to CD4 Councilmember David Ryu.